To purchase Alessandra Branca's book, New Classic Interiors, click here. I first learned about famed designer Alessandra Branca through the Cote de Texas 'Top 10 Designers' series. I recognized many of the rooms in her post, not realizing that Alessandra was the designer behind the spaces. Then came the interview with Alessandra Branca on the Skirted Roundtable, a wonderful discussion of Alessandra's design philosophy and approach to projects. Her design style is 'classic with a twist', and her rooms are more often than not filled with beautiful color (red is a particular favorite) and interesting touches. 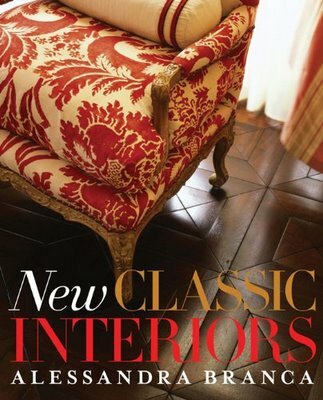 Naturally, I was excited to explore Alessandra's book, New Classic Interiors. It is a wonderful read - full of her philosophy towards decor and images of her body of work. Alessandra is not afraid to take chances, and this makes all of the difference with her design. Her work is beautiful and exquisite, yet also filled with touches of whimsy and fresh new ideas; above all, her rooms are supremely comfortable. I love that her book has pictures of children in so many of the pages, which reinforces the idea that the spaces that she decorates are meant to be lived in every day. Indeed, to Alessandra, the sign of a successful room is to achieve such a sense of comfort that her clients use every room, every day. She points out that in her native Italy, there really is no such things as a separate living room and family room; they are one and the same. 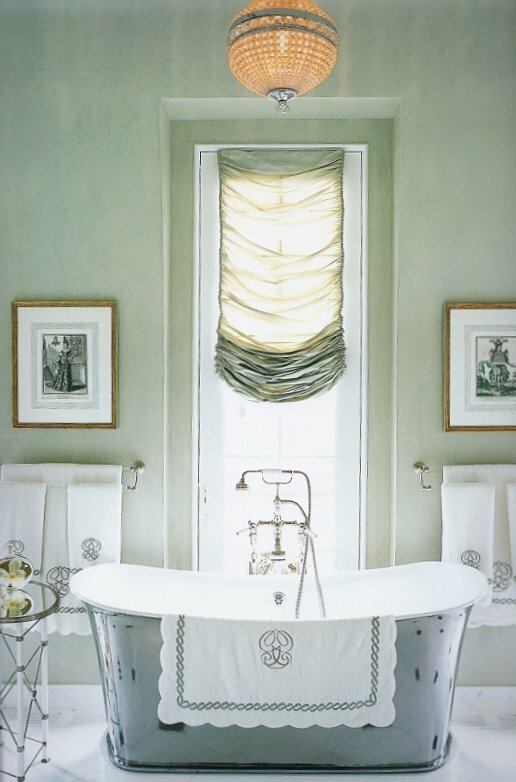 There is always one picture in every book that stands out above all the rest; in New Classic Interiors, it is this picture of an iron bathtub that was found in London, and becomes the stunning focal point of this bathroom. (page 69). Alessandra notes that the Venetian plaster walls (in a watery green-blue that is my favorite shade of color) took ten tries to get exactly right. (Sincere apologies for the partial picture - I was not able to scan this page in its entirety). Your blog always has such great images that spark really great ideas for my own home...today was no exception! That bathtub is the best. The ceiling in the second image, I've personally not seen that done quite like that before - and wow- the iron bathtub, yes, what a focal point! I love that playroom....lucky children! And, I love the lighting fixture over the iron bathtub. So pretty. I've been working my way through TSR podcasts. I am going to try to listen to hers next! I love any image that shows people actually using the space! They add 'scale' but also make the picture just a bit more believable, don't you think? And you can't go wrong with cute kids! It would be wonderful to attend this event, wish I was in Atlanta! Not only is she spectacularly talented, but didn't you get the sense after the SRT interview, she is so fun and nice. The word exhuberant comes to mind! If only I was closer.. She is very talented. That ceiling in the playroom, OMG , and the bath, I can see myself having this design completely! What I love about Branca’s designs is her impeccable taste and her confidence when it comes to using color in her interiors. That ceiling canopy is simply divine! Our favorite. Now to try and figure out how one would go about replicating such a thing. Would love to have this in my foyer. LOVE Alessandra Branca. I was just about to write a post about her myself as I've become somewhat obsessed- can't stop looking at her book- even the graphics are great. And it's probably a good thing I don't live near Atlanta. Branca and Phoebe Howard under the same roof? My heart couldn't take it. What a wonderful, inspiring post on Alessandra. Better than mine if I may say so myself! We are very lucky to have her in town. Super choices: All of these rooms push my buttons. I'm with Architect Design. I prefer houses filled with family and friends. 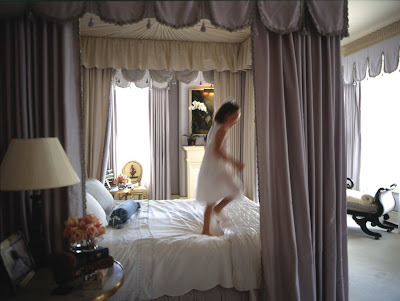 I like rooms that can handle children running amok. Alessandra has exquisite taste and I love how she makes very traditional interiors feel inviting and comfortable. She's proof postitive that you can have high-style and formality without rigidity or stuffiness! Love the iron tub! It is gorgeous. Love all the kiddies running around too. Alesandra's designs are incredible, and that child's playroom is something so unique. Virtually jaw-dropping design. I hope you got your issue with feedburner fixed. I had the exact problem & think (pray) I solved the issue today after much time spent. That bathroom is absolutely exquisite. Love that she actually spent the time (10x) to get it right. That's what makes her decorating so special. It's perfection. Thanks for this great post. Yes please - very much!! I love the children's playroom... it's as if she took all the best and homey things from my grandmother's kitchen and made it timeless and classy! Love her use of red....smiles. You have been nominated for the Beautiful Blogger award!!! My blog has the details! Your blog is just simply awesome!!! my children would have a field day in that playroom. Talk about a place to spur on the imagination without having to be gaudy. Just gave your blog an award (or two). Isn't she wonderful!?!!! Her book is one of the all time greats. I would kill for that bath tub placed in front of the sheer Austrian shade....I could live there.